Astonishing artwork inspired by A New Hope. Hand-numbered limited edition of only 395 pieces! Each lithograph print comes with a certificate of authenticity. Measures 24-inches tall x 18-inches wide. 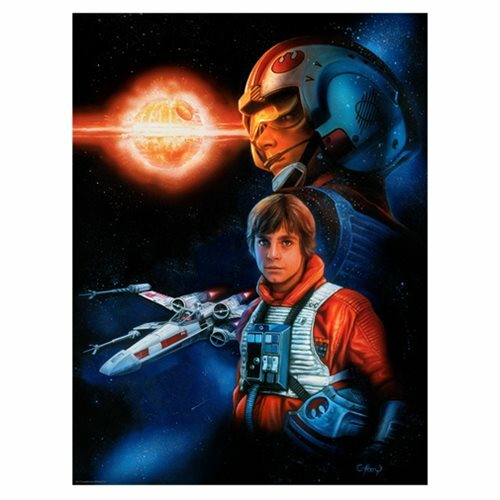 Artist Claudio Aboy reminds us that we should always trust the Force with this eye-popping Star Wars Trust the Force by Claudio Aboy Lithograph Art Print featuring Luke Skywalker and his X-Wing fighter. Trust the Force features artwork inspired by A New Hope. An unframed limited edition of only 395 hand-numbered pieces, it measures 24-inches tall x 18-inches wide. Each lithograph print comes with a certificate of authenticity.